Mantid, you should get LocoPojo! Mantid, why haven’t you gotten LocoPojo to come on? Hey dummy, LocoPojo should have been interviewed WAY earlier. LocoPojo has been on my radar since day 1, since before day 1, but I wanted to wait. I wanted to be close to (if not on top of) the end of a set so he could have a ton to talk about, and speculate on. We did it fam. We stoked the fire, we grabbed all of our spices, and now it is time for a nice roasted chicken while we talk with the man. TEAM AFFILIATION: None, though I work with the ETS, A-Space and have done a little for The Eternal Post. I flit about, and I enjoy collaborating on stuff! MOST NOTABLE ETERNAL ACHIEVEMENT: The stuff I’ve made – My stream and my channel, the flavor text documents and articles, the jokes and memes and moments and unusual brews (of which Greedthorn and Stonescar Maulers are probably my biggest successes) .I’ve broken Clockroaches to the point of patching at least twice, once on the first day of Omens. I have the longest consecutive streak of Masters placements in Ranked, probably tied with one or two other folks who started at the very beginning. PLAYING SINCE:Before Closed started (a Friends and Family build), probably 3 years at this point. I’ve been watching Eternal’s development since the beginning, and from the first build I got to play it was pretty clear they had something truly special. DO YOU CONSIDER YOURSELF A BUILDER, TUNER, OR STRICTLY A PILOT: I’m known as a brewer first- wacky nonsense, yes, but that comes from a lot of experimentation with cards,trying to sample every interaction and constantly challenge my own assumptions or value judgments. I do tune competitively on occasion – I was top points in the Scion’s League, the first tournament series, for most of its existence, and I squeaked into ETS Worlds on the first season. The whole “meme deck” joke is certainly part and parcel of what I do, but I’m competitive by nature and try to design with an eye towards 50% or higher (Except for the first turn kill deck I grind on occasion in casual; those are lotto ticket odds). FAVORITE DECK ARCHETYPE: Big, rampy greed, typically with Marshal Ironthorn and A New Tomorrow. Eternal has an incredibly high tolerance for shenanigans, and you can do some truly busted nonsense and have your opponent still come right back from it the next turn. 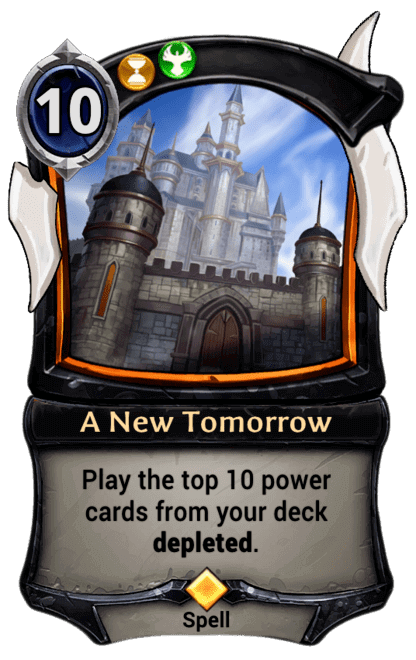 FAVORITE CARD: It’s super close between about ten ringers – but yeah, it’s A New Tomorrow.Lore wise, it’s kind of a speculative, poetic little piece about the Argenport that could have been and might be again, wistful and beautiful in retrospect and now cutely foiled by The End is Near. It establishes a setting and it makes you care. Game-play wise, it’s greed rewarded with more greed, but in away that firmly cements your list as the topdeck winner of control matchups forevermore. There’s tons of cool synergies with Empower, Destiny, top-card matters. It’s influence light so almost any combo of colors with that level of ambition can run it. Waystones and Crests allow you to sort your topdeck and gain a bunch of life in addition to its normal effects and Merchants have allowed it to be a lazy one-of finisher. It’s also one of those awesome weird cards that would be just kind of miserable in physical space – a really good demonstration of the strengths of Eternal’s digital design. Invoke and Crown are close runner-ups – but so is Eilyn, Clan Mother and Shadowlands Tyrant. MOST DISLIKED OR DAMAGING CARD: I’m sincerely not a fan of In Cold Blood’s design, and I think that’s done more damage than my runner up. I think it’s been talked about at length on Trail Stories and elsewhere, though, so let’s talk Won’t Be Pretty, which is bad for similar reasons. Card-wise, this one is sort of a lore-first card gone horribly wrong. It’s out of color: a mean-spirited moment of genuine calculated evil, in the color of a faction that is more about impulse and the reckless artistry of creation and destruction. The play pattern isn’t fun: it’s either giving a really easy choice to your opponent that they then get to beat you over the head with, or its sitting dead in your hand as you stare down one unit on board. It’s uncommon, so it shows up all the time in Draft, and despite being removal you should almost never pick or play it – it’s really, really unplayable, in a way that makes it look like it should be playable to new players and drafters. I’ve given this card a fair shake of deck and draft attempts, and it’s always been a pretty unpleasant experience. Maybe if they buff Crill someday! ONE ETERNAL WISH:I want better UI signalling and management of stuff that I would ordinarily have to pen and paper – showing revealed cards until some element shuffles the hand, and a visual signal of the priority pass that can be shown on the replay.One of Eternal’s central advantages over Magic is how much less busywork you have to do to get to the meat of the games decision making and strategy -clarity and simplicity with all the same strategic depth. I want the client to play to those strengths and get some more quality of life buffs. I also want localized deck slots. 81 is just too few! PERSONAL MANTRA: We try things. Sometimes they even work. MantidMan: Whew, I have told many guests about the numbers of requests I have had to have them on.For you, Loco, I took some extra time to go through the requests for your presence since day one. 87 different people, through twitter, reddit, discord,and in game requests. 87 people have asked for you by name to come and sit around the fire. You are officially the most requested guest we have had outside of a generic “anyone from DWD”. I think one of the reasons you are so loved is your incredible mind for off-the-wall brews, but before we talk about that, we want to know about you. Can you tell us a bit about yourself outside of the community? What is your history with card and strategy games? What do you do in the real world? How do you have fun when you aren’t working on content or crazy decks? What makes LocoPojo tick? LocoPojo: Goodness,I’m honored! I wouldn’t be surprised if some of those other folks would have made that amount waiting as long as I have to get tapped, but that’s still pretty astounding. This community is the best, thanks to both you and them for having me. In my professional life I am a programmer and tester (more tester than programmer at the moment, as I’ve taken a part-time job to try to pursue the stream and channel more heavily). I’m a decently talented writer and a bookish nerd by most stripes. I live in Portland, Oregon and I’ve spent most of my free time there starting up this streaming gig and practicing being as social an introvert as possible – meeting open, interesting people, trying new things, forming cool relationships and growing generally queerer. Mostly I play games, though – board games, card games, first and third person shooters, RPG’s of all stripes, Rogue-likes and whatever the heck Evolve was. I adore design and writing and systems theory, and I really like to look at how games tick from a wide variety of perspectives: for their challenge, for their design, for their writing and art. I’m all about staying sharp and engaged; if I’m not being challenged or experiencing or learning something new I drop it pretty quick.Eternal ticks a lot of those boxes, but it’s primary hook for me is the depth of strategy and what you can build, the way card games become a different game with each deck brought to the table and each new card drawn. It’s total Calvinball, and in over 5000 hours of playing it’s rarely if ever the same game twice. constantly sort and organize paper. You can probably see where this is going… My friend got into the Great Designer Search – a sort of public job interview/contest for the Magic folks – then from there worked hard to land at Dire Wolf, where I got to watch him develop the best card game in the world and then get into it myself at the absolute earliest point. So that was lucky for me. And fun! LocoPojo: Caveats,caveats: A lot of discoveries are made as a group, or simultaneously and concurrently, and who gets the credit for it is largely a matter of who is the loudest or the most watched or the first to publish. I can claim a lot of stuff because I had a part in it, but lots of people made, for example, the thing that became Stonescar Maulers, which was one of the big midrangey decks that led to the Charchain Flail, Flame Blast, Champ of Chaos and Soulfire Drake nerfs (that deck was real good). That was my competitive baby, and we played as much Stonescar Midrange as anybody. I know Peppr tuned a Shimmerpack deck off my stream as we did our usual thing and tried to show everyone that it was a good card (it was, they nerfed it to 8 from 7). I remember some early stuff with Unstable Form and Excavate – turn two hand steals and a viable Carpet Shuffle build – but that’s pretty ancient history. 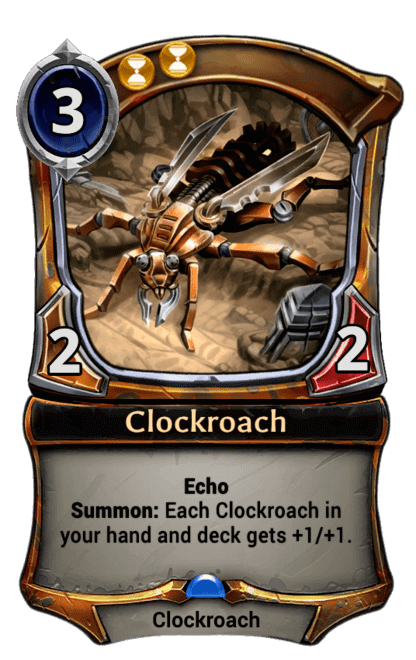 Likewise, Clockroaches/Crown – where the drawn copy no longer received a second skill ontop of the first one – was an easy combo to discover. While I touted it on theforums constantly I’m sure everyone had a part in the eventual echo change. The Piercing Grief revenge bug, where Revenge refreshed on echo cards and led to decks full of recurring Crown-skilled Grief Roaches, was all sheer hot nonsense we did on Day 1 of Omens, though. I dunno if I can claim any credit for New Tomorrow’s changes (from “all your power”, which broke the client in half, to “the top 12 power”, which was fine, to “the top 10 power”, which was ALSO fine but left a little room in the tank for Seeks and Secret Pages), save that I played it a lot. Patch notes that have been influenced at least partly from me being very loud and persistent in feedback (and hopefully polite – be polite in your feedback, folks) are the Champion of Cunning change and changing Crown of Possibilities name back from Crown of Insight, which makes three different times I’ve influenced that card changing and which I’m just going to consider my crowning contribution to Eternal. Speaking of, Insight sounds like a pretty PTJ color name, eh? Might be too hard to distinguish from Instinct, though. Hmm. As to meta stuff, I’ve no clue. 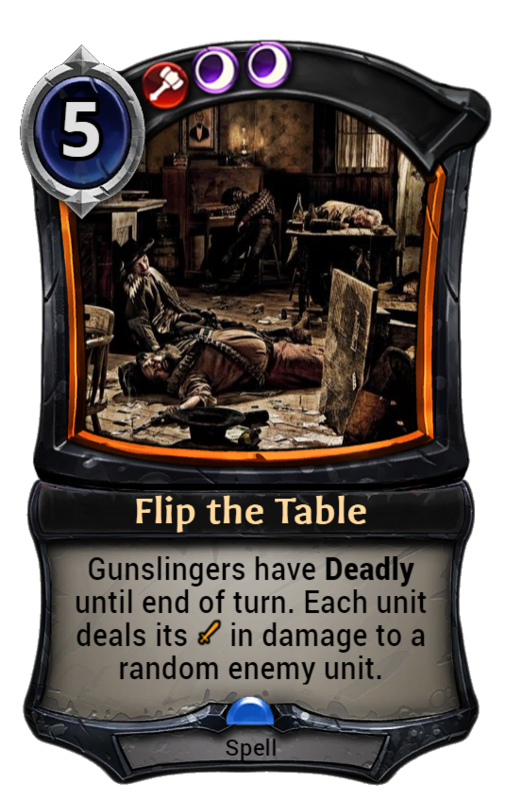 I am constantly unearthing cards from the Scrap Heap and saying “look, look, this is actually good if you do this”, and from the way things change, maybe people listen and maybe they don’t. I almost listed as my mantra “there are no bad cards” because I think that a ton of stuff in Eternal gets missed due to snap value judgments. Cards have a lot of different purposes – some of them only work in conjunction with other stuff,some are designed to show cool story moments or to make Draft a better place,some are for you to have fun with and win in style if not in frequency. The deck that’s still around right now that I’ve pushed the most is Mask Of Torment, which always has different iterations and authors but which I remember fighting hard against public opinion for. I’ve been trying to get people to play End of the Line lately, the card is just a sick stabilizer and value proposition that makes Skycrag and Rakano aggro matchups unrecoverable. MantidMan: Speaking of A New Tomorrow for a second. Outside of the concept of the card being cool from a mechanical perspective, especially coupled with things like Ironthorn as you said. You touched on a hot button for me, something I love talking about. The idea that A New Tomorrow represents the hope of something that “could have been” is deep, and not a piece I had considered. Because you obviously have some love for the lore, what are some of your favorite things that have been explored, or even better, some lore theories that you like? One of my favorites is that Jotun could conceivably be Yeti that have gone through some evolution ritual, infused with magic, spurred only by the flavor within Jotun Birthing Song. LocoPojo: Very Big Spoilers: The end of Dead Reckoning is just good, from like, a AAA storytelling standpoint. I actually didn’t have it in much for the lore of Eternal up until that point, which is still going through a few growing pains but so far up the right track with these monthly updates. This one changed my mind on it in a big way. It does two things really well: First, it takes a character that is largely hateable, who does all the wrong things for the wrong reasons, and then it gives you a way to understand him. Rolant’s speech at the end about family and duty and what led him down the path he took is really good, and it legitimately makes you sympathize with him in a way you haven’t before. You still don’t agree with him – or at least, I’d certainly hope you don’t – but you can understand him, and they hide that punch right to the very end. Second, it does really excellent mechanical storytelling. It plays hard with expectations. Instead of an end boss, you get an execution – a choice between the bullet or the sword, and no choice to walk away because while you are privy to the events, you are not the character. This is a really hard stroke to pull off right – I’ve seen a few games that have done it, The Last of Us is probably the best example. The interactivity of games can connect you to the emotion of an action better than film or art or music can, and if you can do a trick like this where you can use that attachment and also create distance, it is a gut shot. I had, as they say, “the feels”. The thing I love the most that gets explored the least are the Time factions – FJS has been driving the show for a while now, and it’s not a mistake that when Talir shows up she sorts all their dumb nonsense out in like two seconds because she’s way more into the stuff that matters. The Praxis are giant nerds who are going to save the world with their nerdiness. Have you seen Hipshot? That mage is an absurdly talented reality bender who can subjugate nature to his whims and he’s also patently uncool and it’s darling. The Combrei university combines religion with education because they worship progress and technology and science like other people worship gods; and that’s probably why Argenport has tech angels in it. That’s sweet! Meanwhile on the other end of the spectrum, Xenan’s secret-based economy is so secretive that it’s starting to get a little irritating. Like, we’re four sets in and I don’t really think I know what a Radiant is. Knowledge is literally power in Eternal and if you know enough you can apparently go back in time and ride dinosaurs for pets or raise giant statues that are bigger than any brutish thug or gunslinger. There’s an entire Elysian explorers guild, and they go on odysseys into strange lands and timelines and they find insane cool magic and they play sick guitar riffs whenever they find caves with good enough acoustics and somehow these folks are not the main plot of every storyline? COME. ON. Get me an explorers journal side story at least, it’s such an easy way to tour Myria and explain all the ridiculous and awesome things that make it cool. Where are my nerds at? Also, Eternal’s cast is decently diverse, but it could definitely introduce or confirm more characters who are clearly on the LGBTQ+ spectrum. I want at least one trans Stranger (might be one already) and a lot more folks like Eilyn and Talir and Svetya from different backgrounds with different perspectives and different takes. I really dig this triumvirate; I didn’t much appreciate Kaleb or Vara or Eilyn much at first for how little they seemed to do but every one of them has in a very short span of time grown to be people more worthy of the Throne. And then they just decide that they should play their strengths and experiences off of each other and communicate like human beings rather than war endlessly over who’s the most right? That’s so good. Diverse opinions breed constructive conflict and the whole is better than the parts. I’m just really excited for how this is gonna go. Addendum: Just as we’re talking Lore and Time, Ravid, Insect Master comes out. This seems an apt conclusion to the Marisen’s Disciple/Humbug Swarm arc; seems the poor fellow has grown up splendidly. MantidMan: Splendidly indeed, a beard and seeing his mentor beaten within an inch of her life by a prince is enough to harden any gentle and studious soul. I am also a big fan of your custom card, I really like cards that have a good story element to them, I know they cannot all be inclusive to the overall story, but this one has so much flavor and would just be a great tribe card. Do you have any hopes of getting some real cohesive and competitive Tribal concepts in the upcoming set or future sets? In the same vein, would you be for the game never rotating cards so that things like large stockpiles of tribal units could be built? LocoPojo: If I had to guess new tribes, Elves, Birds (owls) and Warriors all seem like they might feature here (I’d love just Bears, it’d be pretty fun to have Eternal Bears as a contrast to Magic’s never ending grizzly 2/2s.) Can it be weird tribal? I love weird tribal. I don’t usually go in on Tribal unless it’s very expressive and distinctive – when units just sort of glom on +1/+1s and cost reductions for being friends you can get this ball of good stuff that feels easy to get into but really hard to get away from creatively. “Why run new elf when you can run best elf?”, that sort of thing. It’s great for signaling what you should take in Draft and giving you some cool signals to follow when building. When it’s ranked competitive, it can be tricky unless there’s enough viable iterations. We actually tried a little Magic: Arena recently; I encountered this ball of merfolk and it felt like the least interesting thing they had going on. I think right now Eternal does tribal safely and occasionally pretty well – light touches, strong draft signalers, extremely expressive and occasionally kookster approaches – Yeti are both a tribe and completely off on their own individual tangents, Explorers care about relics and sentinels, Radiants and Wisps interact with each other. Two of those three could be tuned up and I would be pretty psyched. A lot of the tribes, like Dinosaurs and Gunslingers and Grenadin, are just great from a sheer fun perspective! They feel really distinct, and even better, they feel distinct in ways that don’t feel like Magic tribes. I’d be excited to see new tribal, but Idon’t want too many more Tribal “Lords”. Bond was a cool mechanic,I’d be down for a little more of that. I’m also a limited format person, I like solving puzzles and building things out of limited parts. Rotation feels important and necessary to keep things moving and changing in a way that actually feels good. I always want to be exploring new territory. Sometimes that means saying goodbye to the old stuff, at least on a competitive level. Infinite possibilities can lead to some extremely dumb things happening, but seeing the same best cards gets pretty stale. MantidMan: I know you are a limited Format kind of guy, but a lot of our readers really enjoy a look into the Meta, they want to get ahead. A lot of your viewers enjoy the brews and the tech, but they look for little nuances or tech to take into Ranked. Not that the meta is even that stable right now, changing from week to week. We have this idea that it hovers around midrange and into control, do you think that will change with the new set? Do you think, or hope, that there will be enough of an addition to encourage more fluctuation so that tournaments can be more unpredictable? LocoPojo: If previous sets are any indication, I’d certainly hope so! I’ve personally been encountering a ton of Skycraggro and Haunted Highway despite trying to build for those midrangey control matchups I’ve been casting on the twitch dot tee-vee, so seeing cards like Defiance itself is kind of lovely. Tournament players tend to gravitate towards midrangey stuff always because you can answer more specific things and you throw yourself at the mercy of your draws, not what decks came in to play. But aggro always finds a way when they get too comfortable. Omens was the only set that had a tiny splash at the start, and ithad a lot of jobs to do as a follow-up to Empty Throne. I think DWD’s releases have generally always put a lot of extra stuff in our hands to mess with since then – on top of both of the big sets having some big accompanying shifts, the promos have been pretty steadily playable and getting more so, and the story campaign stuff has had some real ringers that answer very specific meta concerns (sometimes in really interesting ways). Plus, even if it were to get a little too stale, they’re clearly not afraid to kill their darlings. I put my face in Channel The Tempest, what I thought was one of the most iconic cards in Eternal, and then I had to spend an hour changing my overlay because the damn thing costs nine now. That being said, meta change is really about the players. DWD might know a combo exists, they might even have a pretty good idea of what the meta is going to be, but you cannot put the level of human-hours into this game that we do to build the things that we do. Everybody on here is having and seeing cool ideas and iterating and iterating and iterating and it’s all flipping chaos all the time. The meta sure ain’t stale right now, but If you ever think it is, you just gotta go invent something to beat the ones who made it that way. With Invoke the Waystones, if possible. MantidMan: Let’s talk about your content now, if only for a moment. You have a super engaging stream style, and your videos are top notch explanations of how and why things are the way they are. You said earlier that you are going to start doing more again. Can you let us know what some of those plans are? LocoPojo: Well,we’ve been slowly ramping up our stream hours, and the youtube backlog is as long as it’s ever been. I went through two moves this year and I’ve been a bit exhausted and scattered, sometimes it seems like I have less time, not more.That’s slowly turning about now that we’re getting used to a part-time job schedule. The list: Basics remix 4-15 are achievable and I will hopefully be in the rhythm to start punching them out once a week by the time this thing comes out.I also want to do some more advanced tutorials, likely under the name Scion’s School, and some alternate basics stuffs where we discuss particular things like building markets. Those are easier and more likely to show soon. Brews are still our favorite to make, and I want to ramp those up by covering more tournament decks and other lists in addition to my own stuff, as tuning something to the point where I’m OK with it being on Youtube is usually a lengthy process. I have some lore ideas planned but the Oathbook’s doing just fine on that front too, so that might be in the backseat for a bit, especially since Basics is starting to become a weight that I need to shed. I have some smaller ideas too, maybe these short five minute things for newbies. That’s probably more than I can chew til the end of the year. Mostly, though, we’re streaming and highlighting more – 7 PM on weekdays, with a flex day or so, plus earlier and longer streams on weekends and Thursdays whenever I can manage. Drops have done a fair bit to help out, but the community and people who turnout on the regular are fantastic. I have an incredibly friendly and welcoming chat, they’ve been super nice to the newbies and pretty sodium-free. I love them all despite how often they see me miss lethal. MantidMan: That is a lot of content, a lot of time for people to get to know you and what you do.There is no reason that if you are reading this you do not find some time to check out at least one thing that this guy is doing. Now, my favorite part, and how we always close these little chats up: a message, a passion, something that you want to make sure you get across to the people. It does not have to be related to Eternal, it does not even have to be related to content or entertainment of any kind. You show a lot of fervor for a lot of things, but what is a message you want to make sure is out there for the community, something to chew on? 1) Take stock of the things you are challenged on after the fact, away from the court of public opinion, and ask yourself if you can find middle ground or some collective wisdom. Even if the answer is no, it’s worth doing. Don’t be afraid to admit you were wrong or change your mind; good people will always support you or at least scarcely notice. 2) Be kind to other people on principle, always consider the human before pressing enter, and don’t let your own communities ostracize others. The only thing you shouldn’t tolerate is intolerance. If you enjoyed this Interview, especially the bits of Lore, check out THE OATHBOOK as well. Please also take some time to check out InkedGaming.com and use TRS12 at checkout for all of your Holiday purchases!